It’s nearly the time for us all to dust off the gym trainers and start burning off those extra festive calories. It may be the first time you’ve ever stepped foot in a gym, or maybe you’re returning after a hiatus. Either way there is no doubt about it, going alone to a new gym can be utterly terrifying! Your mind plagues you with visions of these gym gods and goddesses milling around with their perfect waists and bulging biceps. But the reality is everyone in that gym is just like you, in all shapes and sizes. So without further ado my friend, here is my guide on surviving your first few trips to the gym alone! Comfortable outfit – wear layers so you don’t feel over or under exposed. Locker padlock/pound – most gyms have lockers, take a small padlock and a £1 until you know which type they are. It also gives you an excuse to scope out the changing rooms and showers. Charged phone/ipod – music is such a great distraction technique and can help you feel a bit more confident while you’re finding your way around. A playlist of uplifting music – prepare a playlist in advance of your favourite motivating songs to keep your head in the right mindset for working out. Headphones – nothing makes me more mardy than forgetting my headphones, I suggest keeping some in your car/bag at all times! Water – fill your water bottle up at the water fountain as soon as you get to the gym so you can have a glance around and see where everything is. Notepad and pen – it’s good to write down what you’ve done and keep a log of the weights you use week to week. This will help you see how you are progressing but can also keep the nerves at bay by having something to keep you busy between exercises. Towel – it is gym etiquette to wipe down equipment after you have used it and try your best to keep sweat at bay so take a small hand towel with you. One really key thing to remember is that really, truly, honestly, no-one gives a hoot about your being there. Most serious gym goers have workout plans to follow; they want to get the job done and leave just as much as you do! People might look up and think “hey look, there’s a new person, cool” but that’s it. Gym communities are normally pretty friendly, and people are more than willing to offer help and advice to you. Small, big, tall, short, whatever, all of these people at some point also had a first day at the gym, so they know exactly how you feel. 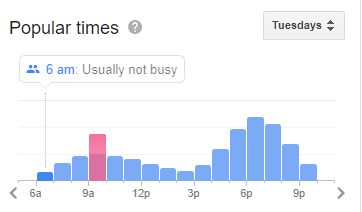 Use Google to see if your gym has a peak time indicator and go when you think it might be quieter, this tends to be really early morning, mid afternoon and then later on at night. It is likely that the member of staff will ask you about this so they can show the most relevant equipment to your needs. It might be an idea to favourite these on your device so you can quickly find them again if you need to remind yourself when you’re in the gym. Movement – basically the exercise you are doing, so a dumbbell curl is a movement/exercise. Reps – short for repetition, this is how many times you will do a movement. If I curl a dumbbell 3 times, that’s 3 reps.
Sets – the amount of rounds you do of an exercise. If I curl a dumbbell 3 times, and I do 3 rounds, that’s 3 sets. Form – form basically means how well you do the exercise; the point of moving weight is to engage the muscle, with the right form you engage the muscles correctly. Tempo – tempo is the speed at which you move the weight and if you pause and hold the weight within a movement, a PT will likely show you the tempo they want you to use for any exercises. DOMS – DOMs means Delayed Onset Muscle Soreness, once you’ve been to the gym you’ll notice your muscles might ache the next few days, this is called DOMs! There’s plenty more but hopefully that’s enough to keep you going for now! OK so you’ve got yourself to the gym, now what!? Make sure you spend a short while to stretch out and get your blood flowing, this is important as it helps to prevent injury. As a minimum I jump on the treadmill for 10-15 minutes to get my blood flowing before my session. This also gives you an opportunity to see what machines are where, and start to plan what exercise you might go for first. At first you will probably feel a little uncomfortable and “out of place”. From the outside it looks like everyone else knows what they’re doing, but don’t let this put you off, everything in that gym is something you can use and have paid for the right to use. Don’t feel like you’re “getting in the way” – most long-time gym goers have a number of alternative exercises ready in their minds; if you are a using a machine they were going to use they’ll just do something else or switch it out for another movement. Or you may find that they’ll ask if they can “work in with you” – that just means they will do a set in between your sets while you rest. And if you’re a woman, don’t be afraid of the free weights section, there may be a lot of men in there but you are welcome too! If you’re not feeling ready to go it alone, sign up for a group class for your first visit. This helps take the pressure off you and also gives you an opportunity to scope out your surroundings and start to get used to things before going it alone. You also might meet someone who you can train with and you may learn some exercises you can do on your own. I hope you’ve found some practical advice here and feel a bit more prepared for your first day in the gym. Just remember, you can do this!